Mexican drug traffickers used to wait at home for shipments of Colombian cocaine that would then be transferred to the United States, the world’s biggest consumer of the white powder. But with Colombian authorities waging war on the illicit drug trade with help from their U.S. counterparts, Mexican narcotics barons have decided to take matters into their own hands. The Sinaloa and Jalisco New Generation cartels have sent their own representatives to Colombia, where rival drug gangs vie for control of the lucrative trade. “They come and supervise the cocaine hydrochloride, it’s purity,” said General Jorge Isaac Hoyos, commander of the army’s Hercules Joint Taskforce at the convulsive port of Tumaco. The port lies in Narino, a territory with the greatest number of coca leaf fields in the world. However, “the Colombians are the ones with the drug trafficking structure,” added the general, who leads a massive anti-narcotics operation involving thousands of soldiers. They have had some success, as evidenced by the submarines seized from drug traffickers that lie abundant in the naval base at Tumaco. 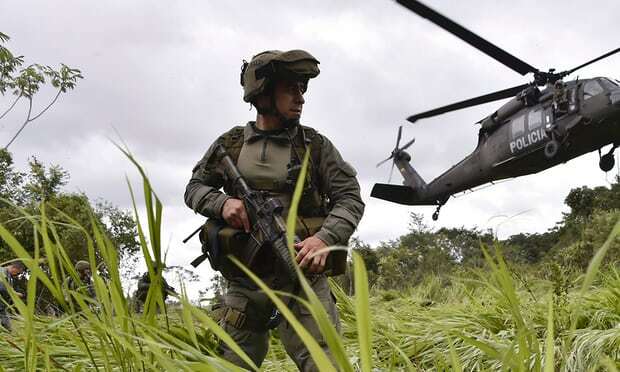 The offensive was launched in reaction to the United Nations claiming last year that Colombia had reached record levels of land being used for illicit crops — 171,000 hectares (422,550 acres) — and cocaine production — 1,379 tons. Speedboats carry dozens of fuel tanks deep into the jungle where narrow wooden paths lead to laboratories producing cocaine, under the watchful eyes of the recently-arrived Mexican supervisors. Only a few dare to talk about them, and only in hushed voices. Silence reins amongst the wooden houses that line the banks of the Mira and Mataje rivers in western Narino department. The military presence is clearly visible in urban Tumaco but that’s not the case in the jungle, where the coca leaf plantations are found. It’s an area infested with rebels from the ELN Marxist guerrillas, FARC dissidents who rejected the hard-won peace accord, and paramilitaries. These groups fight bloody battles to control the 1,300-kilometer (800 miles) long Pacific coast where 39 percent of drug plantations can be found. The Mexican drug cartels sent their emissaries to “secure the cocaine flow” following the deaths or capture of a number of allies, according to American organized crime expert Jeremy McDermott. “Right now, their associates are dead, jailed or invisible, and so they needed to send buyers to Colombia,” said the co-director of InSight Crime, a foundation that investigates organized crime in Latin America. They also needed to keep the corridor open to the U.S. in an industry where other markets are proving far more lucrative to the Colombians. In Spain, a kilogram (2.2 pounds) fetches $35,000, in China $50,000, Russia $60,000 and Australia $100,000. It’s worth a paltry $25,000 in the US. “The Colombians left the American market to the Mexicans because it’s not worth it for $25,000, given the high risk of punitive measures, extradition and the expropriation of goods,” said McDermott. According to the U.S. Drug Enforcement Agency, 84 percent of the cocaine entering the country comes via the Pacific Ocean. In Colombia, Mexican emissaries travel with the drugs being transported by speedboat or submarine to Central America or the U.S., McDermott says. Despite the atrocious levels of violence in Colombia’s lawless jungle areas, it’s actually worsened since the Mexicans’ arrival. Authorities did not move into areas vacated by FARC rebels following the 2016 peace deal, experts say, leaving a vacuum. Violence has displaced 7,800 people along the Pacific coast this year up to November, compared to half that amount during the whole of 2017, according to Ombudsman Carlos Negret. “Violence has increased this year,” he told AFP. Of the 343 rights activists murdered in Colombia since January 2016, 40 percent were in this region. “The power of the money brought by the Mexican cartels brings armed elements into the fold, but also social leaders,” said the Guapi community leader.